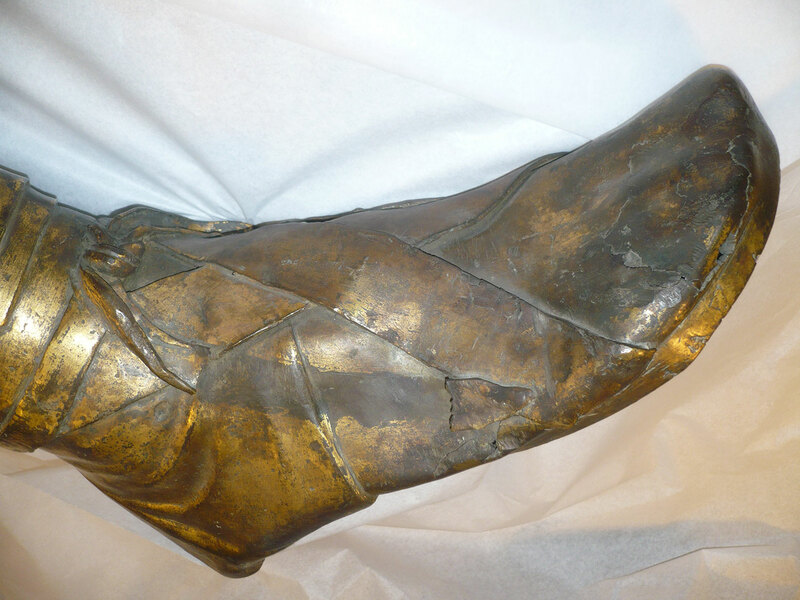 One of the real puzzles from Roman Scotland is this massive gilt bronze leg from Milsington, near Hawick in the Borders. Discovered in 1820, it’s always raised questions. What does it come from? Where’s the rest of it? And why did it end up in a Borders bog? I’ve pondered it idly over the years, but preparing a recent exhibition has given me an excuse to re-examine it. This rush of leg-based enthusiasm was prompted by an imminent deadline – always the best incentive for new research. The Trimontium Trust run an excellent museum in Melrose dedicated to the major Roman fort of Newstead. Each year they put on a special exhibition, and for 2017 we thought the leg would make an excellent puzzle-piece. This led me to have a proper look at it – with some intriguing results. Let’s start with a description. It dates to around AD 100-180 and comes from a statue of an emperor (or perhaps a governor of Britain), bigger than life size, and once seated on a horse. We can tell this because there’s a hole in his heel which would once have held a spur. The hole in the heel once held a spur. 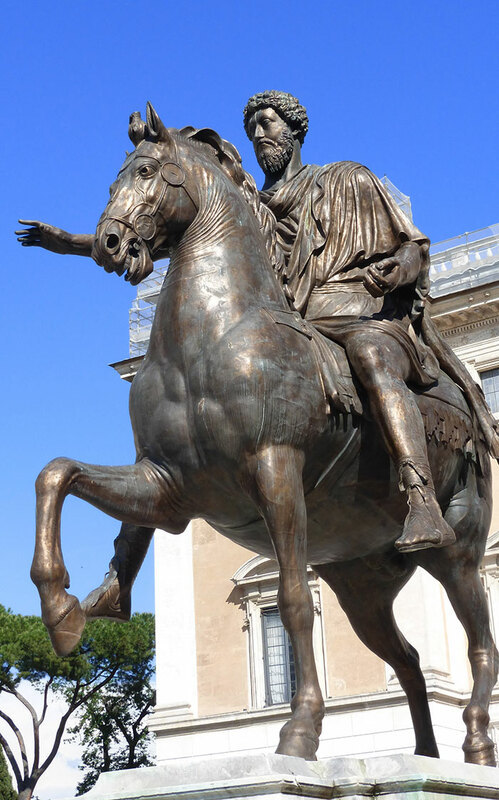 Copy of a statue of the emperor Marcus Aurelius in Rome. Image © John Reid. Such equestrian statues would have looked really impressive – Victorian versions can be seen in our cities today, dominating the streets. Just think of the Duke of Wellington on North Bridge in Edinburgh, or near George Square in Glasgow (complete with traffic cone headgear). 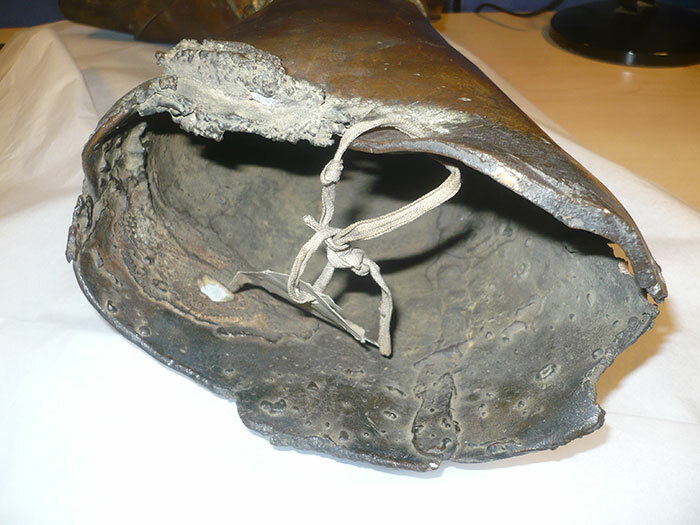 Our Roman gent wore a shoe with a thick sole and two-part upper of supple leather, fastened by thongs wrapped round his ankle. 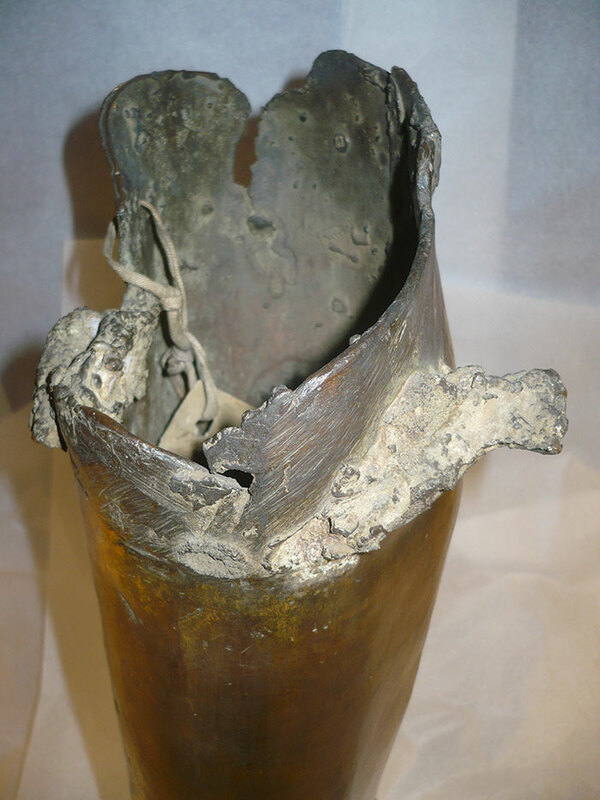 To understand how it was made, we need to get up close to our Roman leg. The statue was modelled from sheets of wax – the seams are well-finished on the outside but really obvious on the inside – and then cast in bronze, with lead added to the melt to make the metal flow better. It was made in several parts which were then fastened together. Originally the leg was fixed to his cloak, traces of which are visible at the top. The surface was coated in gold, but this stops short of the top – no point wasting good gold in areas that wouldn’t be visible! 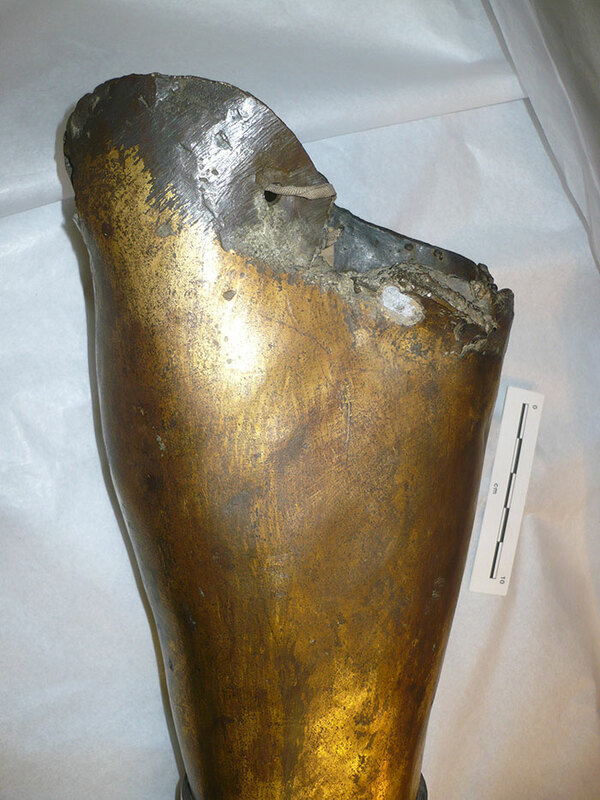 Other clues come from a series of holes around the calf – used either to fasten bits of the statue together, or in the process of casting to hold parts of the mould in place. Look inside the leg for hidden clues. At the bottom of the picture is a seam running down the inside of the leg, where the ends of the wax sheet were joined. 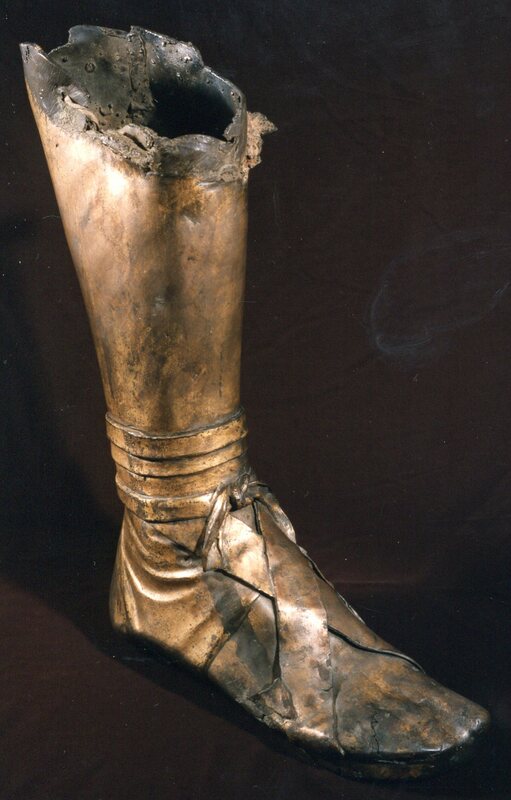 The outside of the leg is covered with gold, but only the visible bits – the top, which was hidden by a cloak, is plain. The thread runs through one of the original holes used in making the statue. Earlier scholars could not imagine such a grand statue had any place in the wilds of Scotland, and assumed it was looted from a major city such as York. However, recent research in Germany has changed our view. By gathering together all the tiny battered fragments found in excavations, they’ve shown that frontier forts also housed impressive imperial statues. So our leg could have come from Newstead, or a lost fort in the Hawick area. But why was it at Milsington? It may seem remote today, but in Roman times it was right by the highway, close to the road which ran south-west down the river Teviot towards Nithsdale – so it’s not so surprising a findspot as you might think. People used to argue the leg was loot, hacked off by a local warband and carried away. But look carefully at the top – it’s not been brutally hacked, but carefully dismantled. The ends are rounded from the original casting, not damaged. When the cloak was cut away, the leg just fell off. 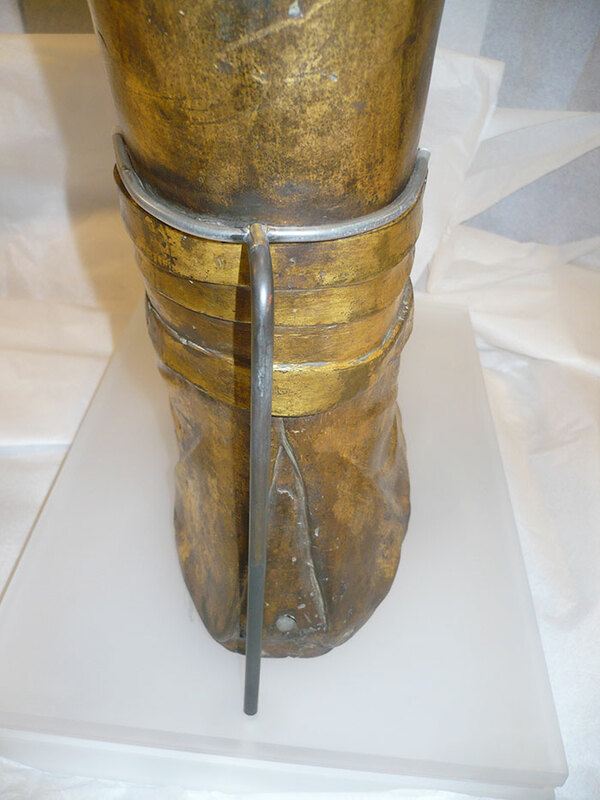 The rounded edges of the top of the leg come from the original casting process. Perhaps it was intended for recycling by the Romans when a fort was abandoned. Or perhaps it came from an emperor who had fallen from grace – the Romans were pretty good at rewriting history, and erasing all trace of an emperor who was deemed to have gone bad. 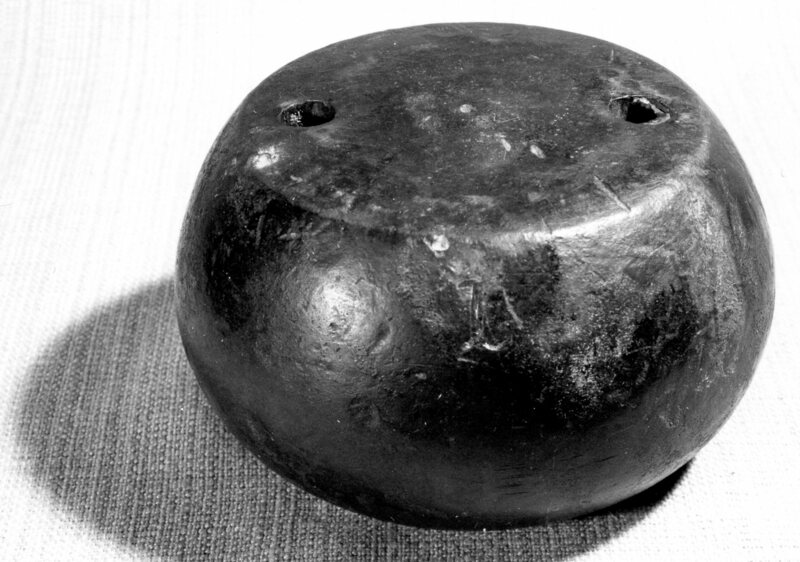 But this doesn’t explain why it ended up in a bog – along with another curious piece of bronze which is either a casing for a large weight or a plinth for another, smaller statue. The curious bronze plinth found at the same time as the leg. Finding fancy metalwork in wet places is surprisingly common – too frequent to suggest they were all just accidental losses. It’s hard to retrieve things from a bog, and that’s the point. People, whether Roman soldiers or local opportunists, put valued objects in these wet places as offerings to their gods. Was this a sacred spot? Is there more to find here? It’s a good excuse for a trip out one weekend to have a look. So – it’s a leg with a story, and still more to tell. Go and see it in Melrose (on show till the end of October) or when it comes back to us later in the year. But be warned, it might not rush back onto display, as I have plans for it… This wee exhibition has whetted my interest and made me think how we can find out more. We’ll try to get X-rays taken to reveal the technological tricks in making it. We can even analyse the metal to see if they were using local lead in the casting alloy. These big statues didn’t move easily – they tended to be cast near where they were erected – so if we can show that Scottish lead was used in the mix, it would support a local origin rather than loot from down south. Interest could be investigating these discoveries …I wish you luck in your quest. Thank you. This was a great read! Braw read, though I’m pretty certain midgies gnawed it aff but failed to organise a working party big enough to fly it to Jura as a learning prop.